From cemeteries to haunted highways, find your thrills at these haunted places in Colorado Springs. This cemetery was part of Colorado Springs before the town was formally founded in 1871. People were buried there dating back to the 1860's. While the cemetery itself may be haunted, the presence many have experienced is in the small Chapel that was built to store caskets and for services in 1910. After many years, the usage of the building declined and quickly fell into disrepair. Cemetery workers using the basement for supplies have seen dark figures. Will Deboer Jr., cemetery manager since 1992, worked to receive funds to restore the building as well as have it listed on the National Register of Historical Places. As the tour for the designation was being conducted, the woman representing the organization felt a negative force move through her entire body and quickly left. The cemetery was even featured on Biography Channel's My Ghost Story. Ancient Native American lore told the story of an Indian God named Manitou throwing the devil into the canyon facings the heavens. The Devil’s Horns rock formation can be found there today. Tales of a local cheating gambler being thrown into the canyon, as well as the finding of other remains from the 1800’s as almost a dumping ground for riff-raff, live on. This location is a popular hangout for high schoolers and teens, especially on summer nights. When the tunnels were built in the 1800’s – it’s said that many workers died in actually building the tunnels. There have been rumblings of a school bus accident ranging from a suicidal driver to an oncoming train. Legend has it that the entire bus full of children perished. Today, many drive through the 2nd tunnel waiting for the car to be moved after putting it in park and turning off the lights. Others have said to see apparitions of men in cloaks. 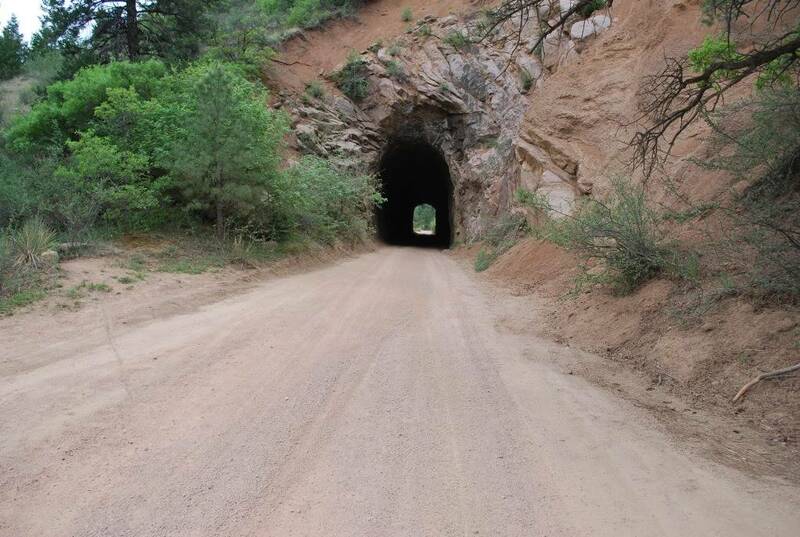 The third tunnel, you are not able to drive through but many peer in wondering the secrets of this spooky spot.